Mechanotransduction is the physiological process where cells sense and respond to mechanical loads. This paper reclaims the term “mechanotherapy” and presents the current scientific knowledge underpinning how load may be used therapeutically to stimulate tissue repair and remodelling in tendon, muscle, cartilage and bone. The purpose of this short article is to answer a frequently asked question “How precisely does exercise promote tissue healing?” This is a fundamental question for clinicians who prescribe exercise for tendinopathies, muscle tears, non-inflammatory arthropathies and even controlled loading after fractures. High-quality randomised controlled trials and systematic reviews show that various forms of exercise or movement prescription benefit patients with a wide range of musculoskeletal problems.1–4 But what happens at the tissue level to promote repair and remodelling of tendon, muscle, articular cartilage and bone? The one-word answer is “mechanotransduction”, but rather than finishing there and limiting this paper to 95 words, we provide a short illustrated introduction to this remarkable, ubiquitous, non-neural, physiological process. We also re-introduce the term “mechanotherapy” to distinguish therapeutics (exercise prescription specifically to treat injuries) from the homeostatic role of mechanotransduction. Strictly speaking, mechanotransduction maintains normal musculoskeletal structures in the absence of injury. After first outlining the process of mechanotransduction, we provide well-known clinical therapeutic examples of mechanotherapy–turning movement into tissue healing. We searched PUBMED, EMBASE, MEDLINE, CINAHL, Google, Wikipedia, Melways and various library collections for the earliest reference to “mechanotransduction”. The first paper referenced under this term is by McElhaney et al in volume 1 of the Journal of Biomechanics, but the term is not used in that paper.6 Although there are 2441 citations in MEDLINE for mechanotransduction, the word is not found in the current edition of the Oxford English Dictionary. A useful formal definition of mechanotransduction might be “the processes whereby cells convert physiological mechanical stimuli into biochemical responses”. Mechanotransduction is generally broken down into three steps: (1) mechanocoupling, (2) cell–cell communication and (3) the effector response. To simplify this for patients, these same elements can be thought of as (1) the mechanical trigger or catalyst, (2) the communication throughout a tissue to distribute the loading message and (3) the response at the cellular level to effect the response—that is, the tissue “factory” that produces and assembles the necessary materials in the correct alignment. The communication at each stage occurs via cell signalling—an information network of messenger proteins, ion channels and lipids. In the following section, we detail these three steps using the tendon as an illustration; the fundamental processes also apply to other musculoskeletal tissues. Mechanocoupling refers to physical load (often shear or compression) causing a physical perturbation to cells that make up a tissue. For example, with every step the Achilles tendon receives tensile loads generated by three elements of the gastrocnemius–soleus complex and thus, the cells that make up the tendon experience tensile and shearing forces. Tendons can also experience compression forces (fig 1A,B) These forces elicit a deformation of the cell that can trigger a wide array of responses depending on the type, magnitude and duration of loading.7 The key to mechanocoupling, as the name suggests, is the direct or indirect physical perturbation of the cell, which is transformed into a variety of chemical signals both within and among cells. Tendon cell undergoing (A,B) shear and (C) compression during a tendon-loading cycle. Tendon tissue provides an example of cell–cell communication. (A) The intact tendon consists of extracellular matrix (including collagen) and specialised tendon cells (arrowheads). (B) Tendon with collagen removed to reveal the interconnecting cell network. Cells are physically in contact throughout the tendon, facilitating cell–cell communication. Gap junctions are the specialised regions where cells connect and communicate small charged particles. They can be identified by their specific protein connexin 43. (C–E) Time course of cell–cell communication from (C) beginning, through (D) the midpoint to (E) the end. The signalling proteins for this step include calcium (red spheres) and inositol triphosphate (IP3). Mechanical loading stimulates protein synthesis at the cellular level. (A) A larger scale image of the tendon cell network for orientation. We focus on one very small region. (B) Zooming in on this region reveals the cell membrane, the integrin proteins that bridge the intracellular and extra-cellular regions, and the cytoskeleton, which functions to maintain cell integrity and distribute mechanical load. The cell nucleus and the DNA are also illustrated. (C) With movement (shearing is illustrated), the integrin proteins activate at least two distinct pathways. (D) One involves the cytoskeleton that is in direct physical communication with the nucleus (ie, tugging the cytoskeleton sends a physical signal to the cell nucleus). Another pathway is triggered by integrins activating a series of biochemical signalling agents which are illustrated schematically. After a series of intermediate steps those biochemical signals also influence gene expression in the nucleus. (E). Once the cell nucleus receives the appropriate signals, normal cellular processes are engaged. mRNA is transcribed and shuttled to the endoplasmic reticulum in the cell cytoplasm, where it is translated into protein. The protein is secreted and incorporated into extracellular matrix. (F) In sum, the mechanical stimulus on the outside of the cell promotes intracellular processes leading to matrix remodelling. To highlight the crucial role of mechanotransduction in underpinning musculoskeletal rehabilitation, we propose to re-introduce the term “mechanotherapy” for those many situations where therapeutic exercise is prescribed to promote the repair or remodelling of injured tissue. Mechanotherapy was first defined in 1890 as “the employment of mechanical means for the cure of disease” (Oxford English Dictionary). We would update this to “the employment of mechanotransduction for the stimulation of tissue repair and remodelling.” This distinction highlights the cellular basis of exercise prescription for tissue healing and also recognises that injured and healthy tissues may respond differently to mechanical load. Databases and library searches did not reveal the term mechanotherapy being used in other ways in physical therapy. To close off this introductory piece we summarise clinical studies that have shown or implied a potential for mechanotherapy to promote healing of tendon, muscle, cartilage and bone. Tendon is a dynamic, mechanoresponsive tissue. One of the major load-induced responses shown both in vitro24 and in vivo31 37 38 in tendon is an upregulation of insulin-like growth factor (IGF-I). This upregulation of IGF-I is associated with cellular proliferation and matrix remodelling within the tendon. However, recent studies suggest that other growth factors and cytokines in addition to IGF-I are also likely to play a role.39 Alfredson et al examined tendon structure by grey-scale ultrasound in 26 tendons with Achilles tendinosis, which had been treated with eccentric exercise. Remarkably, after a mean follow up of 3.8 years, 19 of 26 tendons had a more normalised structure, as gauged by their thickness and by the reduction of hypoechoic areas.40 This study and others41 show that tendon can respond favourably to controlled loading after injury. Research into the ideal loading conditions for different types of tendon injury is still ongoing. Like other musculoskeletal tissues, articular cartilage is populated by mechanosensitive cells (chondrocytes), which signal via highly analogous pathways. Alfredson and Lorentzon treated 57 consecutive patients with isolated full-thickness cartilage defect of the patella and disabling knee pain of long duration by periosteal transplantation either with or without continuous passive motion (CPM). In this study, 76% of patients using CPM achieved an “excellent” outcome, whereas only 53% achieved this in the absence of CPM.44 Tissue repair was not directly assessed in this case series, but the results encourage further research into the underlying tissue response and the optimisation of loading parameters.
. The effectiveness of active exercise as an intervention for functional ankle instability: A systematic review. Sports Med 2008;38:553–63.
. Is there evidence to support the use of eccentric strengthening exercises to decrease pain and increase function in patients with patellar tendinopathy? Phys Ther 2006;86:450–6.
. Effectiveness of exercise therapy: A best-evidence summary of systematic reviews. Aust J Physiother 2005;51:71–85.
. Progressive resistance exercise in physical therapy: A summary of systematic reviews. Phys Ther 2005;85:1208–23.
. Mechanotransduction and the functional response of bone to mechanical strain. Calcif Tissue Int 1995;57:344–58.
. Electric fields and bone loss of disuse. J Biomech 1968;1:47–52.
. Early responses to mechanical load in tendon: Role for calcium signaling, gap junctions and intercellular communication. 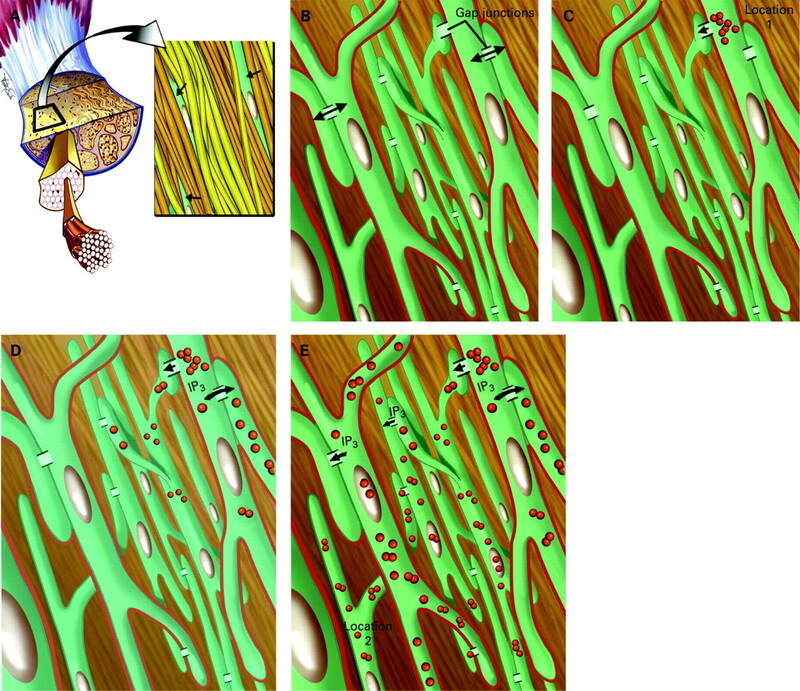 J Musculoskeletal Neuronal Interact 2005;5:70–84.
. Mechanical signals and IGF-I gene splicing in vitro in relation to development of skeletal muscle. 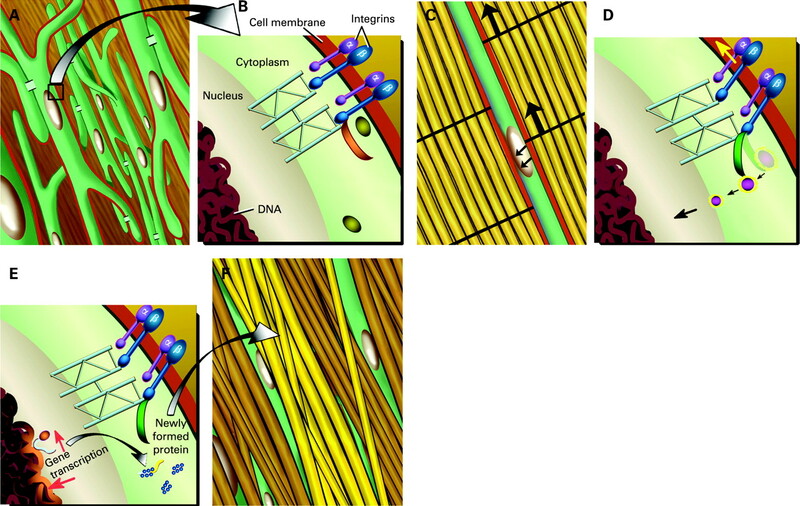 J Cell Physiol 2005;202:67–75.
. Mechanotransduction in striated muscle via focal adhesion kinase. Biochem Soc Trans 2007;35:1312–13.
. Activation of stress-activated protein kinases (SAPK) in tendon cells following cyclic strain: The effects of strain frequency, strain magnitude, and cytosolic calcium. J Orthop Res 2002;20:947–52.
. In: Woo SL, Renstrom P, Arnoczky SP, eds. The molecular biology of tendinopathy: signaling and response pathways in tenocytes, in tendinopathy in athletes Malden: Blackwell Publishing, 2007.
. Connexin 32 and 43 gap junctions differentially modulate tenocyte response to cyclic mechanical load. Eur J Cell Biol 2006;85:1145–54.
. Regulation of chondrocytic gene expression by biomechanical signals. Crit Rev Eukaryot Gene Expr 2008;18:139–50.
. Molecular biology of the cell. New York: Garland Science, 2002.
. Geometric control of cell life and death. Science 1997;276:1425–8.
. Integrin binding and mechanical tension induce movement of mRNA and ribosomes to focal adhesions. Nature 1998;392:730–3.
. The structural and mechanical complexity of cell-growth control. Nat Cell Biol 1999;1:E131–8.
. Mechanical control of cyclic AMP signalling and gene transcription through integrins. Nat Cell Biol 2000;2:666–8.
. In vitro alterations in cytoskeletal tensional homeostasis control gene expression in tendon cells. J Orthop Res 2005;23:1211–18.
. Effect of amplitude and frequency of cyclic tensile strain on the inhibition of MMP-1 mRNA expression in tendon cells: An in vitro study. Connect Tissue Res 2003;44:181–7.
. Effects of repetitive motion on human fibroblasts. Med Sci Sports Exerc 1993;25:603–7.
. Stretch and interleukin-1beta induce matrix metalloproteinases in rabbit tendon cells in vitro. J Orthop Res 2002;20:36–9.
. Rabbit tendon cells produce MMP-3 in response to fluid flow without significant calcium transients. J Biomech 2002;35:303–9.
. PDGF-BB, IGF-I and mechanical load stimulate DNA synthesis in avian tendon fibroblasts in vitro. J Biomech 1995;28:1505–13.
. Gap junctions regulate responses of tendon cells ex vivo to mechanical loading. Clin Orthop 1999;(367 Suppl):S356–70.
. ATP modulates load-inducible IL-1beta, COX 2, and MMP-3 gene expression in human tendon cells. J Cell Biochem 2003;89:556–62.
. Changes in the amplitude of cyclic load biphasically modulate endothelial cell DNA synthesis and division. Vasc Med 1997;2:19–24.
. Verapamil decreases cyclic load-induced calcium incorporation in ros 17/2.8 osteosarcoma cell cultures. Matrix 1992;12:439–47.
. Response of rabbit achilles tendon to chronic repetitive loading. Connect Tissue Res 2001;42:13–23.
. Mechanobiology: Similarities and differences between in vivo and in vitro analysis at the functional and molecular levels. Recent Res Devel Biophys Biochem 2002;2:153–177.
. Tenocyte responses to mechanical loading in vivo: A role for local insulin-like growth factor 1 signaling in early tendinosis in rats. Arthritis Rheum 2007;56:871–81.
. Influence of mechanical and biological signals on gene expression in human mg-63 cells: Evidence for a complex interplay between hydrostatic compression and vitamin D3 or TGF-beta1 on MMP-1 and MMP-3 mrna levels. Biochem Cell Biol 2005;83):96–107.
. Bone “mass” and the “mechanostat”: A proposal. Anat Rec 1987;219:1–9.
. Bone’s mechanostat: A 2003 update. Anat Rec A Discov Mol Cell Evol Biol 2003;275:1081–101.
. Exercise is medicine and physicians need to prescribe it!. Br J Sports Med 2009 Jan;43:3–4.
. Physical inactivity: the biggest public health problem of the 21st century. Br J Sports Med 2009;43:1–2.
. Expression of insulin-like growth factor I, insulin-like growth factor binding proteins, and collagen mrna in mechanically loaded plantaris tendon. J Appl Physiol 2006;101:183–8.
. Short-term strength training and the expression of myostatin and igf-i isoforms in rat muscle and tendon: Differential effects of specific contraction types. J Appl Physiol 2007;102:573–81.
. Exercise-dependent IGF-I, IGFBPS, and type I collagen changes in human peritendinous connective tissue determined by microdialysis. J Appl Physiol 2007;102:214–20.
. Eccentric training in patients with chronic achilles tendinosis: Normalised tendon structure and decreased thickness at follow up. Br J Sports Med 2004;38:8–11; discussion 11.
. Recent progress in flexor tendon healing. The modulation of tendon healing with rehabilitation variables. J Hand Ther 2005;18:80–5; quiz 86.
. Gene expression in muscle in response to exercise. J Muscle Res Cell Motil 2003;24:121–6.
. Muscle injuries: Optimising recovery. Best Pract Res Clin Rheumatol 2007;21:317–31.
. Superior results with continuous passive motion compared to active motion after periosteal transplantation. A retrospective study of human patella cartilage defect treatment. Knee Surg Sports Traumatol Arthrosc 1999;7:232–8.
. Cyclic pneumatic soft-tissue compression enhances recovery following fracture of the distal radius: A randomised controlled trial. Aust J Physiother 2007;53:247–52.
. Cyclic pneumatic soft-tissue compression accelerates the union of distal radial osteotomies in an ovine model. J Bone Joint Surg Br 2006;88:411–15.
. Effect of cyclic pneumatic soft tissue compression on simulated distal radius fractures. Clin Orthop Relat Res 2005;433:183–8. This is an open-access article distributed under the terms of the Creative Commons Attribution Non-commercial License, which permits unrestricted use, distribution, and reproduction in any medium, provided the original work is properly cited. © Khan et al 2009 This is an open-access article distributed under the terms of the Creative Commons Attribution Non-commercial License, which permits unrestricted use, distribution, and reproduction in any medium, provided the original work is properly cited. Copyright © 2018 by the BMJ Publishing Group Ltd & British Association of Sport and Exercise Medicine.